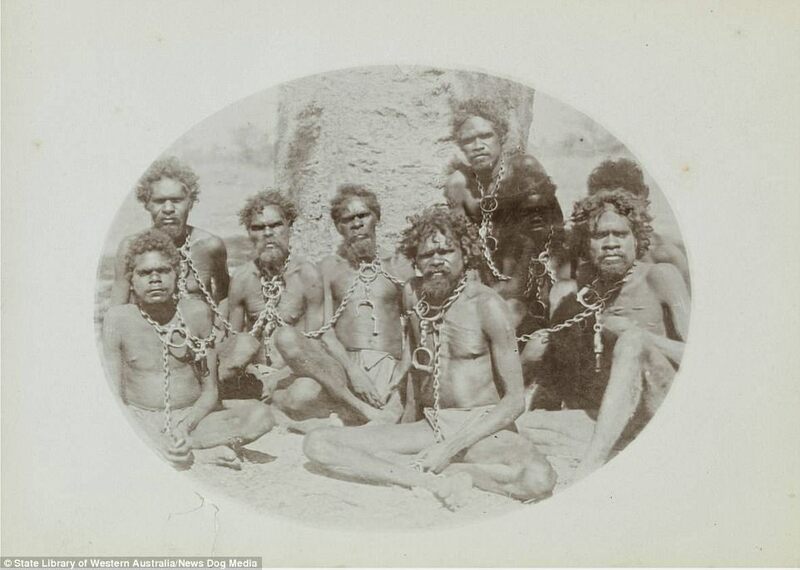 A shocking photograph of Aboriginal men lined up, shackled with heavy chains around their necks, and being guarded by white men armed with rifles is just one of many confronting images captured in the late 1800s. 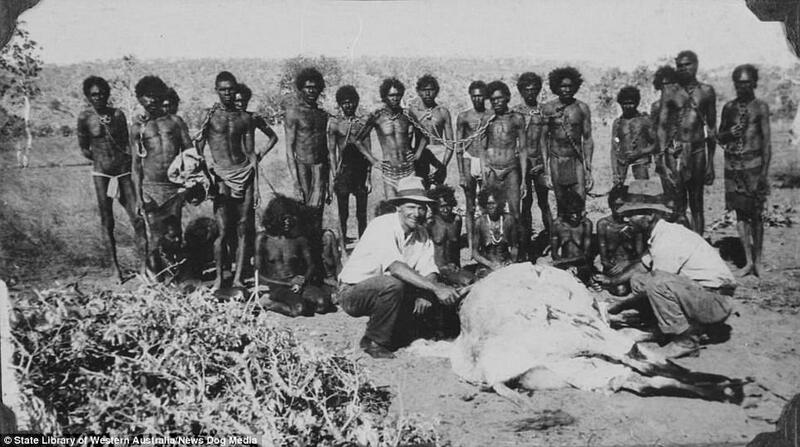 Black and white photos have emerged showing the cruel treatment of Indigenous Australians at the hands of white settlers in the late 1900s. 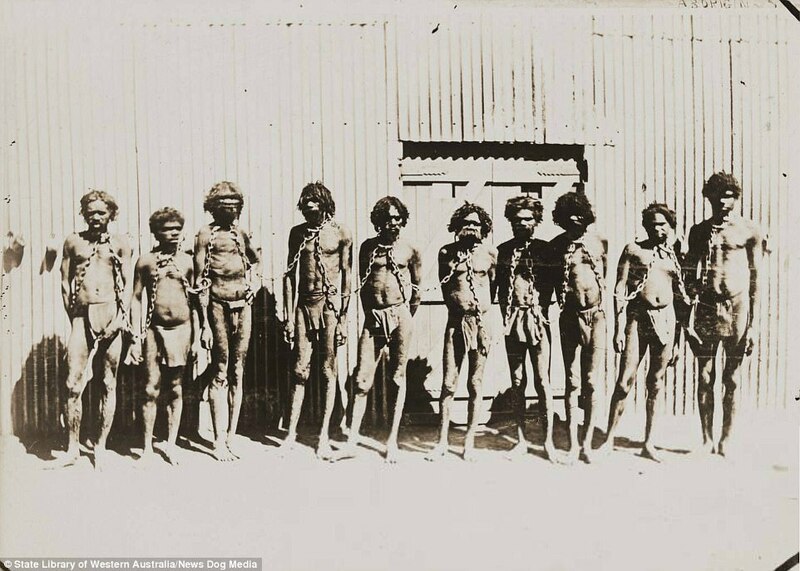 Other harrowing pictures depict Aboriginal men and boys chained together, standing or sitting, wearing just a cloth around their waists. 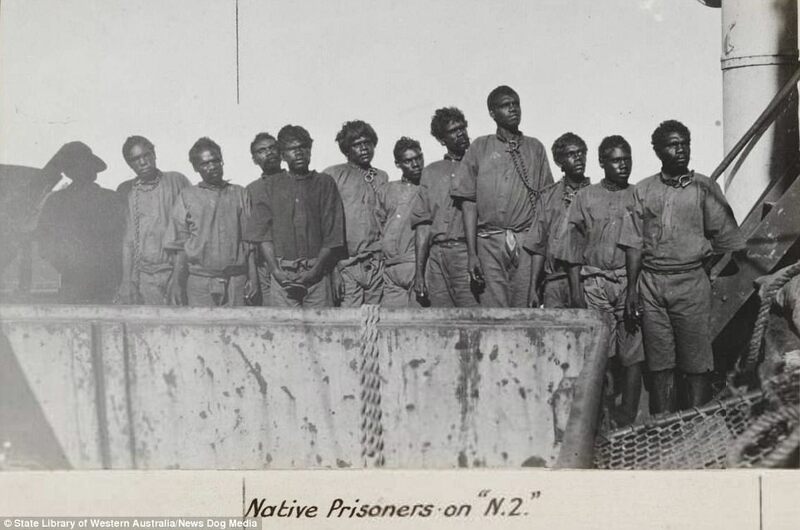 The photos, taken between 1890 and the 1930s, show Aboriginal prisoners being captured moments after being caught committing petty crimes such as killing cattle. 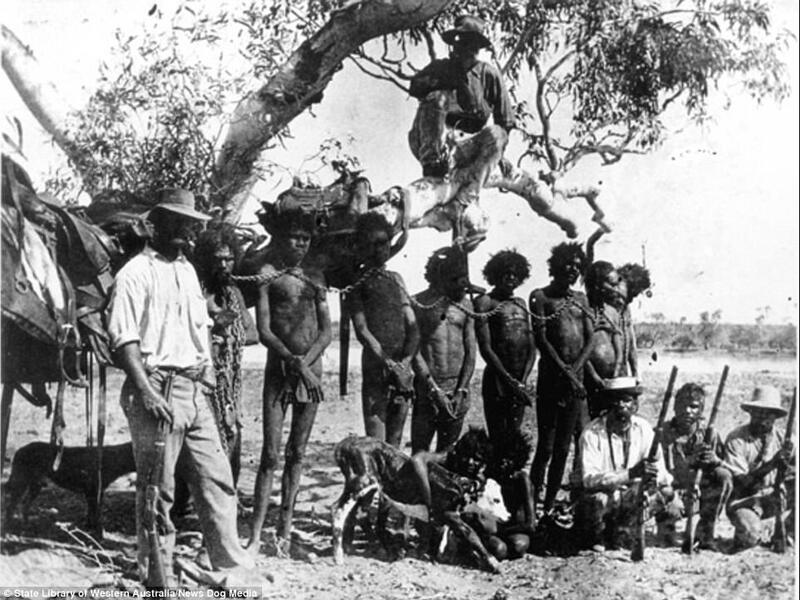 The raw images show rows of chained Indigenous people standing under the shade of a tree with police men and ‘Aboriginal trackers’ pictured with four huge rifles. 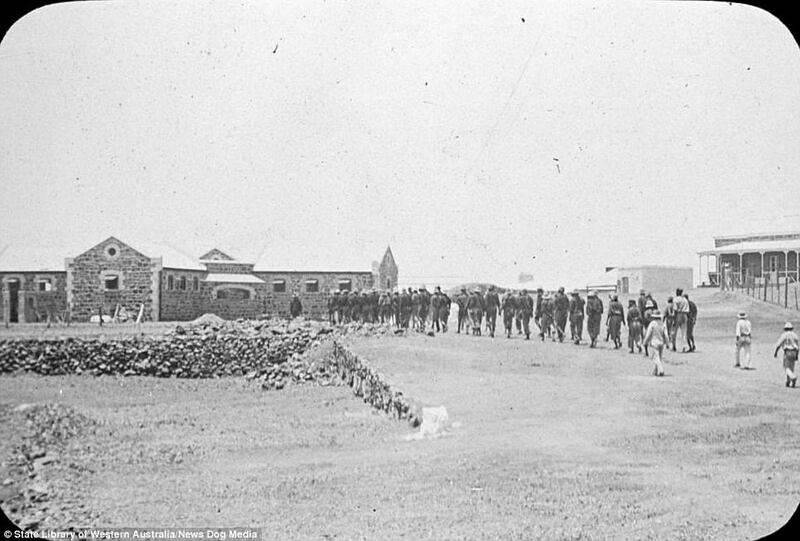 Police were paid per indigenous prisoner and cruelly brought them into jail using chains. 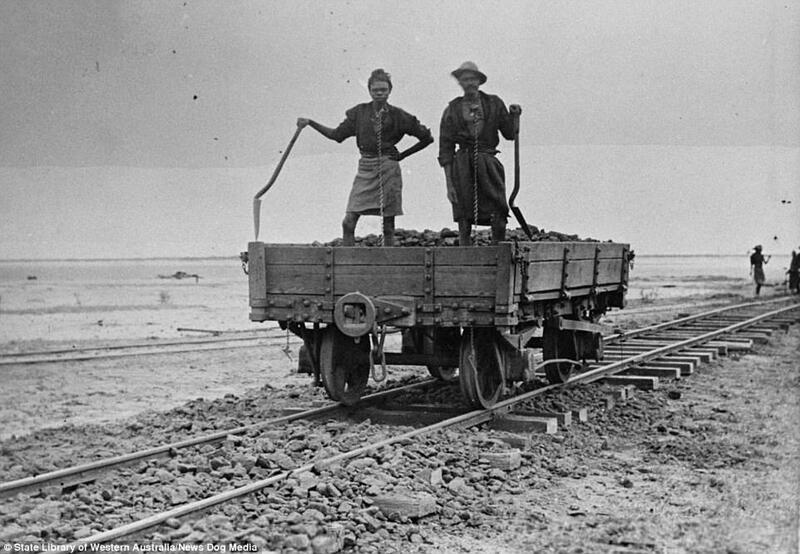 While some Aboriginal prisoners are captured working on a boat, other prisoners were forced to lay railways in Derby, Western Australia. 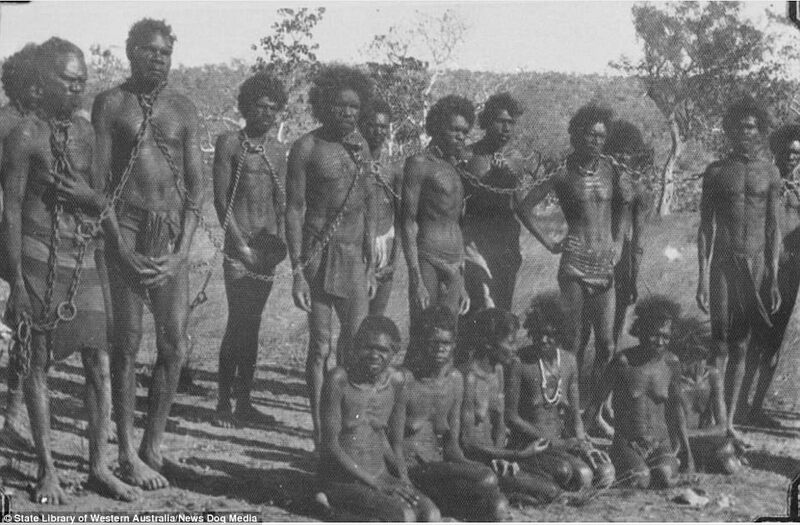 In early Australia, incarceration was used as a tool to weaken the Aboriginal Australians and they were often arrested for petty crimes such as stealing and killing cattle. 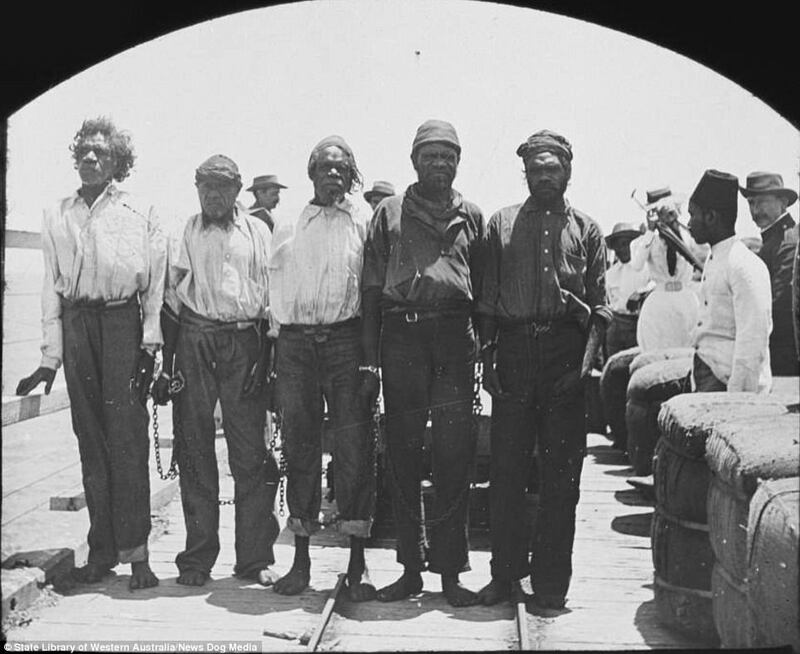 The confronting collection of photographs show Aboriginal prisoners across the country, from on board ships to working on wharf rail lines and chained to railway wagons. 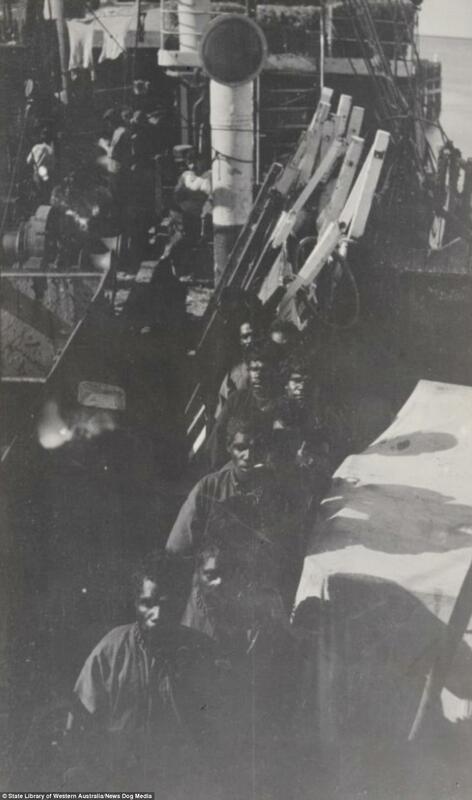 One of the photos is captioned ‘native prisoners on N2’, which is believed to be a ship, shows 12 Aboriginal men lined up with chains to their necks, dressed in rags. 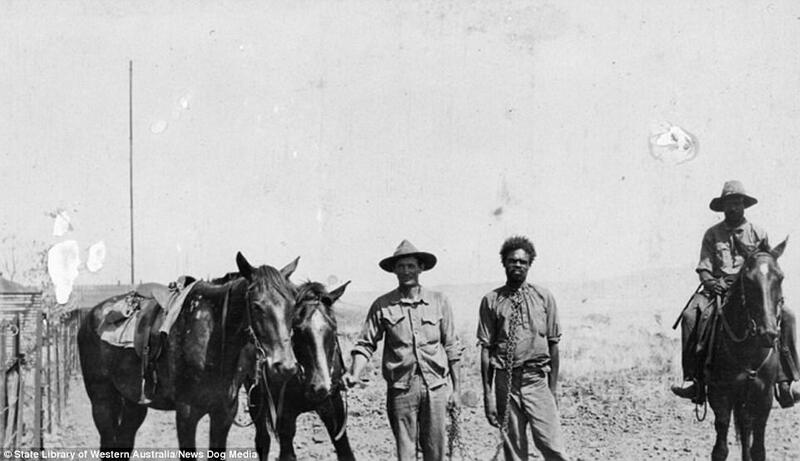 Two white men were photographed leading one Indigenous prisoner by a chain alongside three horses and whip in hand around 1910. 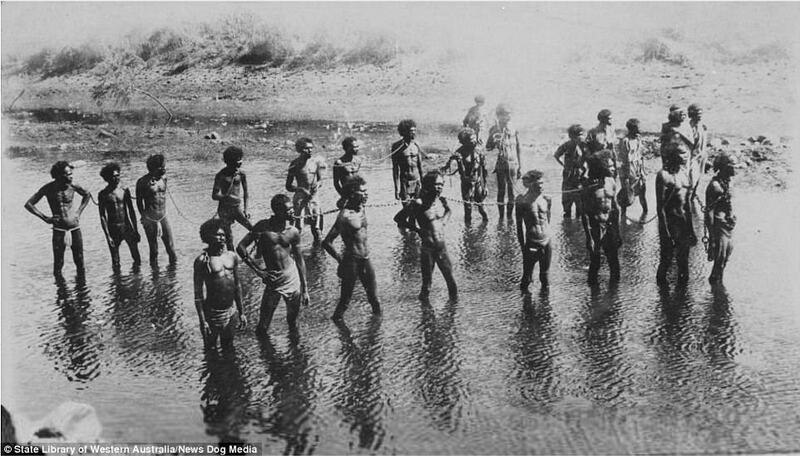 At least 22 Aboriginal prisoners are seen to be chained together while standing in a shallow river of water wearing a cloth around the groin region. 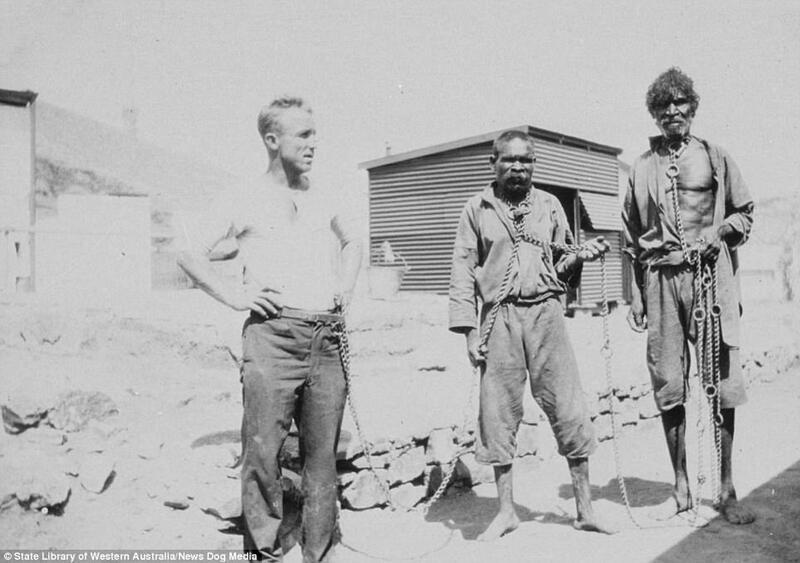 Another image shows a white man dressed in a shirt and trousers holding a chain that is connected to two elderly looking Indigenous prisoners. 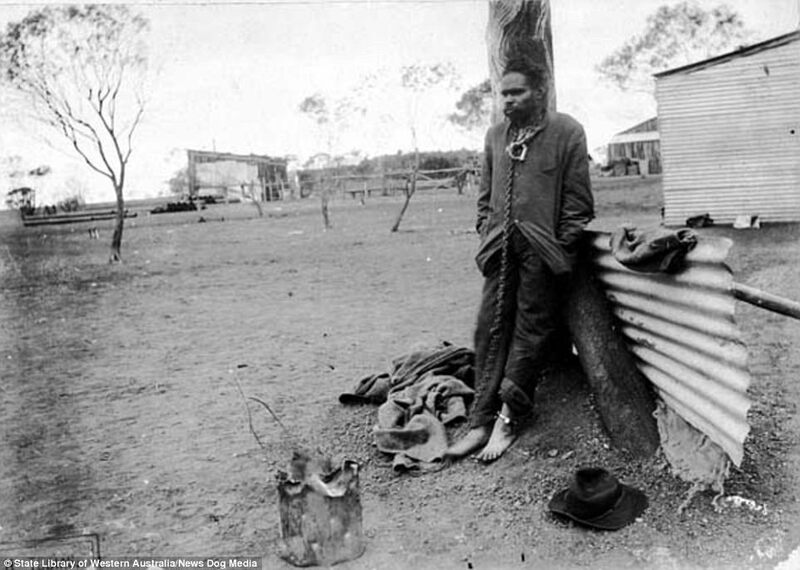 A chilling image shows one lonely Aboriginal man standing in chains as he leans against a tree with a piece corrugated iron at the stump of the tree as well as a hat and pile of cloth. 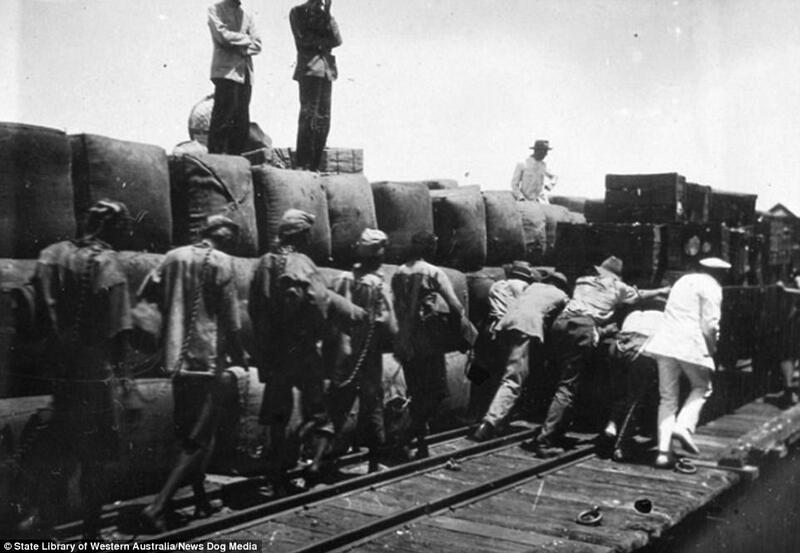 A line of Indigenous men were photographed at the turn of the century wearing chains during their transit to jail, surrounded by what appears to be white first class citizens. 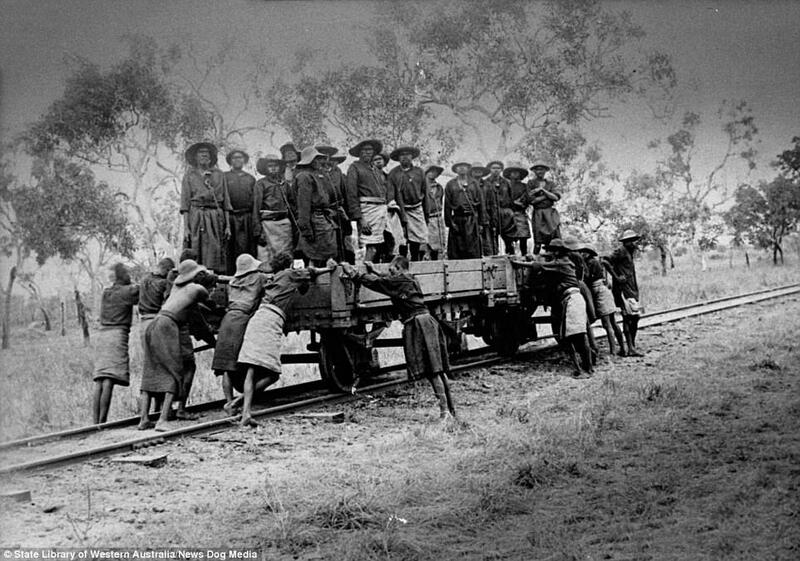 The haunting photos show the disturbing history and abuse of aboriginal people in the early twentieth century. Australia is marking their ten year anniversary of the adoption of the United Nations Declaration on the Rights of Indigenous Peoples (UNDRIP). One decade ago, the declaration was passed to combat the discrimination, marginalisation and human rights violations of the 370 million Indigenous people living in more than seventy countries today. 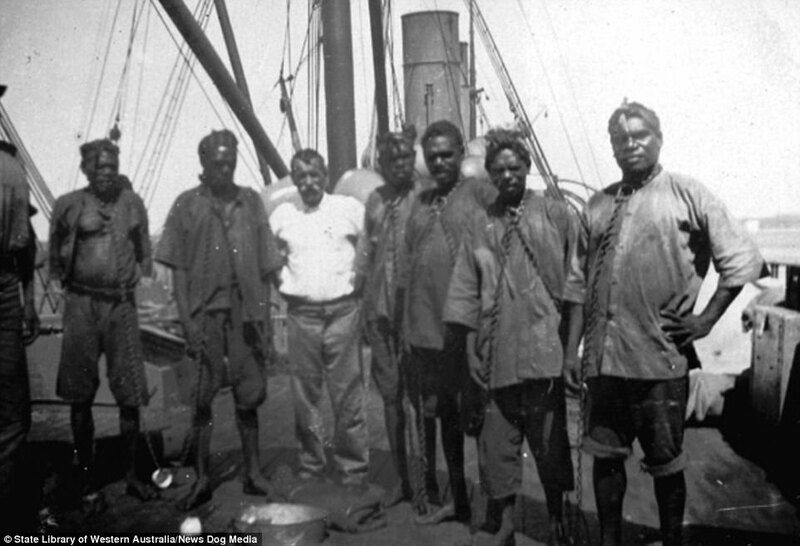 A decade since this landmark legislation, shocking images of entrapped Indigenous Australians emerged, serving as a reminder of the dark past and oppression that was suffered.